It all starts when Harold Roach, newspaper deliveryman for the little towns along the Michigan shore, finds a bundle on the side of the road. A bundle with a body inside, a young girl clothed in an old-fashioned white dress. As in most small towns, the death is soon the topic of all gossip, especially since the victim was a local girl, but no one can give a reason for the crime. Janice Root, by all accounts, was a harmless, likable person. When another girl disappears, people at first don’t want to believe it’s related to Janice’s disappearance, but Zoe Zola, little person and “almost-famous author,” decides to put the two together and investigate. The appearance of Fitzwilliam Dillon, a new resident in town, also a little person, and a millionaire, along with his eccentric friends, doesn’t help the case but it certainly hinders Zoe, as Fitz seems to do nothing but get on her wrong side, irritating him simply by his presence. Fitz’s offer of two million dollars to Bear Falls for a community project doesn’t help. Juxtaposed to this one-sided hate relationship is the recurrent romance between Jenny Weston, Zoe’s next door neighbor, and Tony Ralenti, retired cop and Jenny’s on-again/off-again beau. Jenny’s has an offer of a job that will take her from Bear Falls. Will her leaving prod him to ask her to stay or will he let her go? The identity of the murderer of Janice Root and the abductor of Camille Otis will be a shock to everyone, as will the reasons for the crimes. The first thing most readers will note in this story is that from the moment of introduction, the “heroine” Zoe Zola appears to have a chip on her shoulder. She starts off remarkably belligerent, with no cause, even to her friends. Her somewhat unfriendly attitude to new arrival Fitzwilliam Dillon, seems without basis and may cause a negative reaction in some readers. As the story progresses, her behavior changes and a more friendly Zoe appears, to the reader’s relief. Though the discovery of the crime happens within the first three pages, this story moves at a leisurely pace in solving it. As with any story involving small towns, especially the cozy mysteries, and a series with recurrent characters, there has to be an introduction to the usual cast. Bear Falls’ citizenry are almost all clichés in that respect, and bringing each one into play takes a great deal of time, explaining who everyone is, their relationship to everyone else, and their own particular quirks and habits—such as Minnie Moon’s determination to foist her daughter off on some unsuspecting but eligible bachelor, and Camille Otis’ disastrous entrance into the world—some of which become downright irritating after the third or fourth repetition. This, of course, takes a great deal of time so the actual investigation of the crime, during which a second one has occurred, doesn’t begin until the eighth chapter. It gets to the point where the crimes seem almost incidental. The plight of victim Camille Otis, as told through her point of view, however, shows this young lady to have courage and determination, as she manages to survive until her rescue. It is the most in-depth and dramatic part of the book, interspersed in the often trivial, sometimes petty, goings-on of the townsfolk. Even without the onus of the instant gratification generation, the reader may find this book simply too chatty, too detailed, and too much interested in everyone’s opinion and too little in getting around to the reason for the story, namely finding out who killed Janice and where Camille has been hidden. 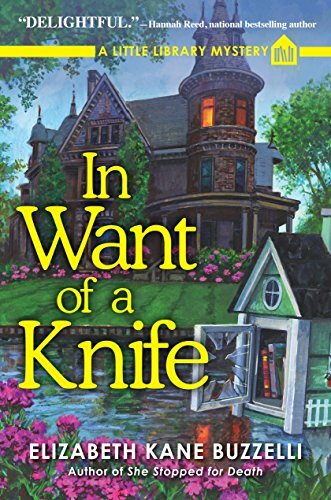 In Want of a Knife is a slow-paced chronicle of abduction and murder with some very dramatic high points giving the victim’s point of view.